ANDY Stubbs, its managing director, believes a new pro-am format used for the £250,000 Prostate Cancer UK Scottish Senior Open is the way forward for the European Senior Tour as he bids to give the likes of Paul Broadhurst, the winner at Archerfield Links on his over-50s debut, a lot more playing opportunities over the next few years. A decade ago, the circuit boasted 23 tournaments, the majority of which were in Europe itself but also included events in Barbados, Trinidad & Tobago, Egypt and Bahrain, where the end-of-season Tour Championship was held. In Mauritius, it still has a glamorous venue for that event, but, in total, the 2015 schedule consists of just 12 events. Factor in two of those being US-based majors and it would be an understatement to say there’s precious little for the rank-and-file players to get excited about at the moment as they enter the twilight of their careers on the main European Tour. “This is as tough as it’s been,” admitted Stubbs, who has been involved with the Senior Tour for more than 20 years. “We’ve had a couple of recessions but never before have we had Europe in such a financial mess. The regular Tour has been the same. Seven events in Spain to one. We had two in Spain and now we have none. “There’s been many things that have affected us. We used to be supported by tourist boards, finance services companies, banks, insurance services, real estate developments etc, but they have gone in the last five years. A real hindrance has been the bribery act, corporate governance kind of thing of what companies can and cannot do. As was the case with events in both Germany and Jersey earlier this year, the one in which Broadhurst made a winning Senior Tour debut – he beat Austrian-based Scot Gordon Manson at the second extra hole in a play-off after forcing that by holing a 20-foot downhill birdie putt at the last – was played as a pro-am for the first two days. Staging the long-running event for the first time, Stubbs hailed Archerfield Links as a “terrific” venue. “They are good at events and corporate activities – the service levels are great,” observed the well-travelled Englishman. 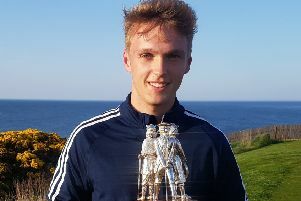 Tom Younger, chief executive at the East Lothian venue, said he had been “delighted” with the success of the tournament and described Broadhurst as a “good friend to Archerfield” through DJ Russell, who designed the two courses. While a wedding ruled out such a possibility on this occasion, a Sunday finish is likely next year, when Stubbs is hoping Colin Montgomerie, a three-times Senior major winner since he turned 50, will be in the field. The tenth player to win first time out on the circuit, Broadhurst birdied the 18th three times in a row to deny St Andrews-born Manson his second triumph of the season. “I was due a play-off win as my record was two victories in 12,” said the Englishman as he celebrated claiming a £38,000 top prize.